When Kirby Star Allies was announced for the Nintendo Switch, I expected a bit more than what we've seen on the 3DS handheld throughout the past few years. While my experience with the Kirby games is well under a decade, Star Allies in many ways feels like a full game built around the mini-game modes that have been tacked on to each subsequent handheld release. Star Allies rarely has a strong moment that hooked me in with some thrilling aspect of its gameplay or some unique mechanic that left me wondering why It hadn't been included before. Kirby Star Allies has none of these things and rarely kept my attention peaked during the short 6 hours it took to complete. It's not the worst Kirby game I've played so far, but it certainly isn't great. Kirby, to me, has been one of Nintendo's most stagnate franchises. HAL Laboratory has been the core developer of Kirby games since the character's debut in Kirby's Dream Land for the Game boy in 1992. The developer has made some substantial strides in evolving the Kirby series, but Star Allies feels so much like a huge backstep than what other characters on the platform have seen with the likes of Breath of the Wild and Super Mario Odyssey. I'm not expecting Nintendo to create a game on that level for the little pink wonder, I just want to see the Kirby games evolve into something far more than what they currently are. 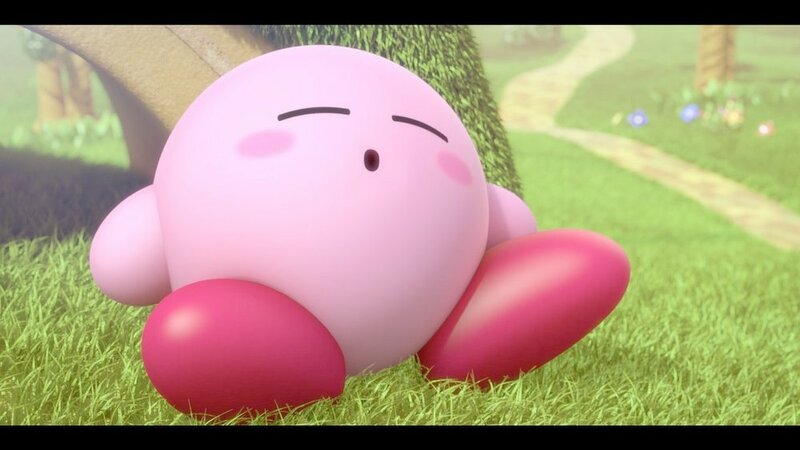 Star Allies follows the typical Kirby formula where the little pink fluff will inhale various enemies and adapt their powers for his own use. Borrowing a concept from Kirby Super Star from the SNES days, Kirby can have partners that assist him during his adventures. The core difference here is that Kirby can be joined by 3 AI companions or a group of friends each with a Joycon. As Kirby approaches a special type of enemy, he can toss out little hearts that will convert that foe into Kirby's bestest pal. These characters can combine powers during combat or use them to solve elemental based puzzles like using fire to light a fuse with a fire whip when it's just out of reach or freezing flowing water to let a burning fuse pass by. 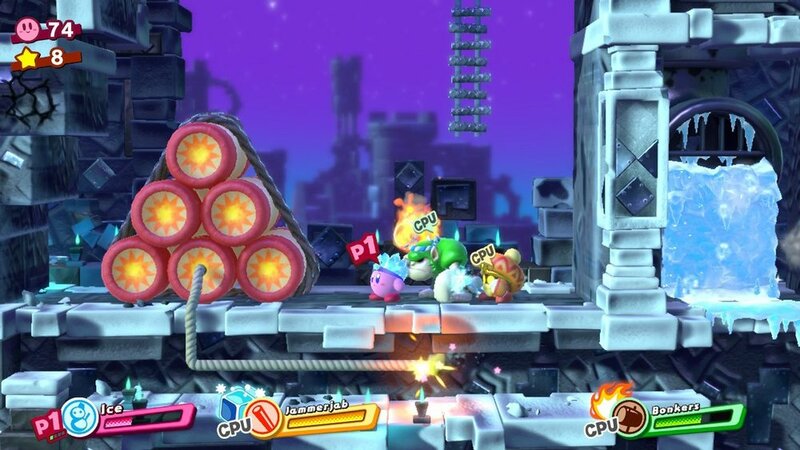 The combative elements of Star Allies borrow a lot from the beat-em'-up co-op mode of Kirby: Planet Robobot called Team Kirby Clash, which eventually became its own standalone release. While the use of each character's powers to solve puzzles is a new concept to this formula, it doesn't fully make the game stand out. What was impressive about past Kirby releases, at least a good portion of them, was that they had a gameplay hook to keep the game fresh and original. Planet Robobot had its Kirby-styled mechs, and Kirby's Epic Yarn was, and still is, the most imaginative Kirby game to date. Plot has never been the strongest part of a Kirby game, let's be honest. Usually, the character stumbles across some sort of evil happenings and does his part to stop said evil. When a corrupted heart falls from the sky and attempts to corrupt little innocent Kirby, it ends up granting Kirby the ability to befriend anyone they touch, with a few exceptions. There are nearly 30 different abilities for Kirby to mix and match his team out of with four new abilities added to the series. Artist, Festival, Spider, and Staff join the existing abilities from various Kirby games. The mixing and matching of these abilities is similar to how mixing abilities worked in Kirby 64: The Crystal Shards or Kirby: Squeak Squad on the Nintendo DS. Combining abilities will help you not only solve puzzles but to locate various collectibles and secret areas that usually will grant rainbow puzzle pieces or access to bonus levels in each of the four worlds. The puzzle pieces will be used to unlock some Kirby Artwork, and those who are familiar with Friend Pass on the 3DS will recognize the same basic format here. Locating secret areas and unlocking the bonus levels are quite easy at the start as most levels fence post their secret locations in very obvious ways and often will have the required ability nearby to ensure you don't miss it. This hand-holding changes in the later levels as it can be much harder to find not only the secrets but the whereabouts of certain enemies for the use of their abilities. The AI in Star Allies will often smash and bash its way through each level as long as you keep up. While it never truly feels like the game is playing itself, you can sit back and have the AI slowly, in some cases, accomplish most of your tasks. I've sat at low health on a boss and floated around the screen as my AI companions did the dirty work. Should an AI fall in battle, you can revive them back with a portion of their health, or just dismiss them entirely, or even inhale them to take on their ability. The puzzles themselves will always have the AI drop what it's doing to assist you, meaning you don't have to worry about the AI wandering about as you attempt to trigger parts of the puzzle and have them just standing around, like in say The Last Guardian, where that damn Bird Dog would often sit there staring at me like I had a third arm. Standing atop platforms will trigger friendship events that will turn Kirby and his pals into instruments of destruction, sort of. 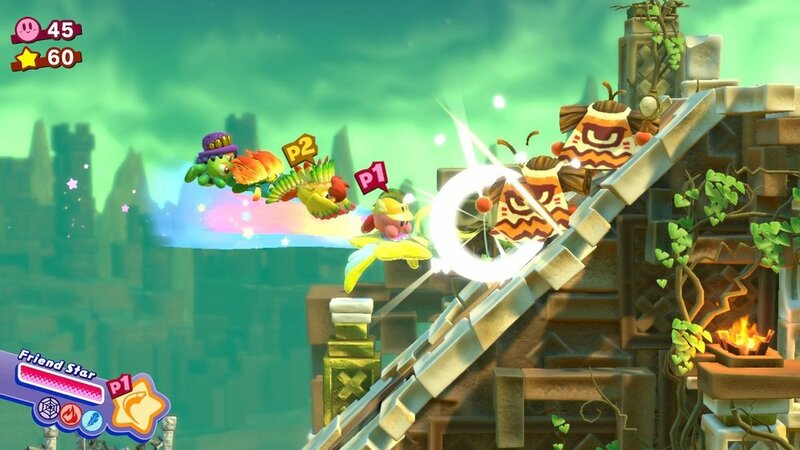 While you can form a friendship circle and bash through portions of the level, you can also form a friendship bridge to assist other characters in transporting a key to a locked door, or fly aboard the Star Allies Sparkler, which is probably the best power in the game. 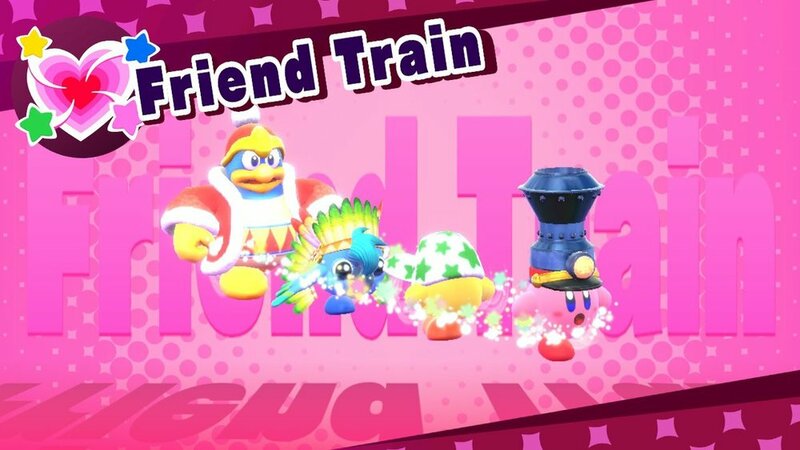 While I've briefly mentioned that Kirby Star Allies can be played with a group of friends instead of just relying on the AI, there is a small caveat to this jump in and jump out co-op Kirby action. 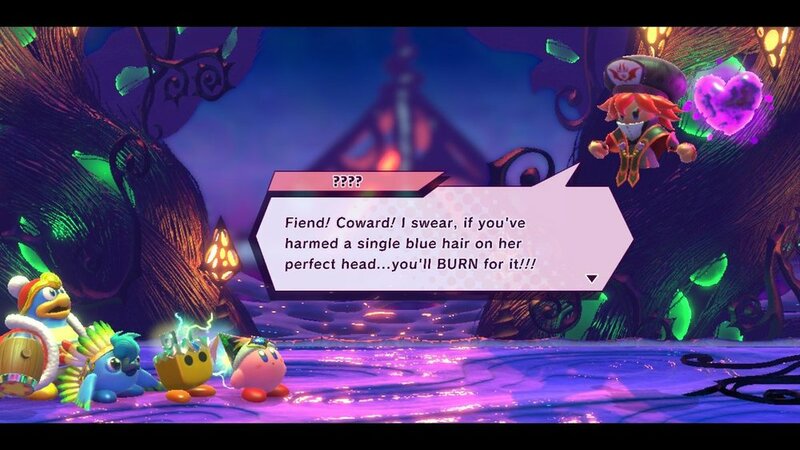 Each joining player is subjected to use whatever frenemies that Kirby has hearted, so working in tandem with player one is crucial to getting the most out of this game. While most of the companions are fun to use and offer some unique powers, there are a few that just don't measure up, so getting stuck with them can often sour the experience. I did enjoy the fact that you can just jump in while someone is playing and also leave as well, all without having to exit to the main menu. One of the more odd choices to this game, and I'm sure this is present in previous games, is the peck-on-the-cheek healing ritual when characters use random food items and then appear to give out small little kisses when healing their companions. It caused a few giggles when playing with a few friends, and when every member of your team gets involved, it has these small few seconds of quick starts and stops as Kirby is going on the mack-attack. The boss encounters of previous Kirby games certainly have this game beat hands down as while Star Allies does feature a few engaging boss battles, there were only a few that really had me hooked. While the final boss is certainly the best I've seen in the series for quite some time, I did also enjoy The Grand Mam, a bomb-equipped foe where you are required to cut off the bombs and set their fuses, forcing you to swap between characters in order to use certain abilities. There are also several fights you will have multiple times with slight variants. You'll fight the typical Kirby Tree a few times, and the story-based mage-like characters will see action more times than I think was required. Despite any issues I have with the game feeling remarkably uninspiring, Star Allies is still a visually fun game featuring the best visuals for a Kirby game to date. It still feels and plays and identifies with what has come before it, and in many ways, it could just be described as a high-definition Kirby game and that's not necessarily a bad thing. Some levels are action-packed and feature some clever puzzle solving and some bad guys to beat up, but there are several instances of nothingness, not a puzzle or enemy to discover. There are a total of four worlds featured in Star Allies; Dream Land, Planet Popstar, Jambastion, and Starlight Heroes. In Dreamland you will encounter King Dedede, whereas Meta Knight will join you in Jambastion, one of the more satisfying worlds included. These characters can enter and leave your party, but can only be brought back to the team via the Dream Palace, a location designed with a roulette wheel of chance. Much like all of the previous Kirby games, some additional game modes have been added, but honestly, these are probably the worst selection of them I've seen in years. Star Slam Heroes is a batting practice mini-game that lacks any real depth or staying power, as does Chom Champs which is simply just a mini-game centered around tree-cutting. The Ultimate choice, despite its ominous title, is picking a set team and ripping through boss after boss. The Guest Star ???? Star Allies Go! mode is the only one with any real meat to it, but effectively it simply revisits certain locations from the campaign instead of offering us anything new. With a good group of people, Kirby Star Allies can be an enjoyable time, but it still feels like a whole game built around past elements of Kirby games instead of offering us anything new. Kirby needs a title on the level that other Nintendo characters are getting, a title that revamps the Kirby landscape. It's not that I didn't enjoy my time with the game, because there are some aspects of the game I did enjoy, but it still disappointed me in how much of this game I've seen and played a dozen times before. kirby star allies WAS PURCHASED BY THE REVIEWER.